RBTools has been an important part of the life of Review Board users for many years. While it started off as a single tool for posting review requests, its feature set has evolved with time, turning into an extensible set of tools and APIs for talking to Review Board. Today, we're finally pulling RBTools out of the 0.x era with the release of RBTools 1.0. Both the RBTools commands and the Python API now support Python 2.7 and 3.5+. RBTools now does a better job determining which repository it's working with, in case there's confusion. For example, a Mercurial repository nested in a Git-managed home directory will no longer cause problems. Git repositories in particular are now easier to work with. When generating a diff, RBTools now looks for the nearest upstream parent commit or branch, instead of requiring that users or repositories configure a specific tracking branch. Writing your own automated review solutions for Review Board 3.0 or RBCommons just became easier through the new rbt status-update command. Your scripts can use it to file a pending status update on a review request (showing that checks are being performed) and then update it to say that all is well or to report issues that need to be fixed. This is useful for in-house continuous integration setups where you're analyzing code for errors, style issues, documentation, or any other requirements you might have. rbt land can now land multiple review requests tied together using the Depends On field. This is a precursor to the new DVCS support coming soon in Review Board 4.0.
rbt setup-completion was added to enable auto-completion of RBTools commands and arguments in Bash and ZSH shells. rbt alias was added to help you list and test out your custom aliases. rbt post --submit-as can now automate posting review request updates, and not just new review requests, on a user's behalf. rbt post -m and rbt publish -m let you specify a custom description of your draft's changes when publishing (equivalent to filling out the "Describe your changes" box when publishing in the browser). rbt post --trivial-publish and rbt publish --trivial let you publish trivial updates to a review request without sending out e-mails to everyone (when using Review Board 3.0 or RBCommons). rbt status now lists the review state and local branch for each review request you have up for review. Warnings and errors in command output is now specially highlighted to help it stand out. Several fixes and improvements for Git and Subversion compatibility. The API has been improved, supporting extra_data fields and easier pagination of resources. And plenty of other fixes and improvements. See the release notes for the full list of changes in 1.0. RBTools is out today for Windows, Linux, and Mac. Head on over to the downloads page for installation instructions. Today's release of Review Board 3.0.7 is focused on enhancing privacy options and protection in Review Board, improving defaults and adding optional GDPR-compliant privacy settings for servers. There's also the usual assortment of bug fixes. Users can enable Private Profiles through the My Account -> Profile page. 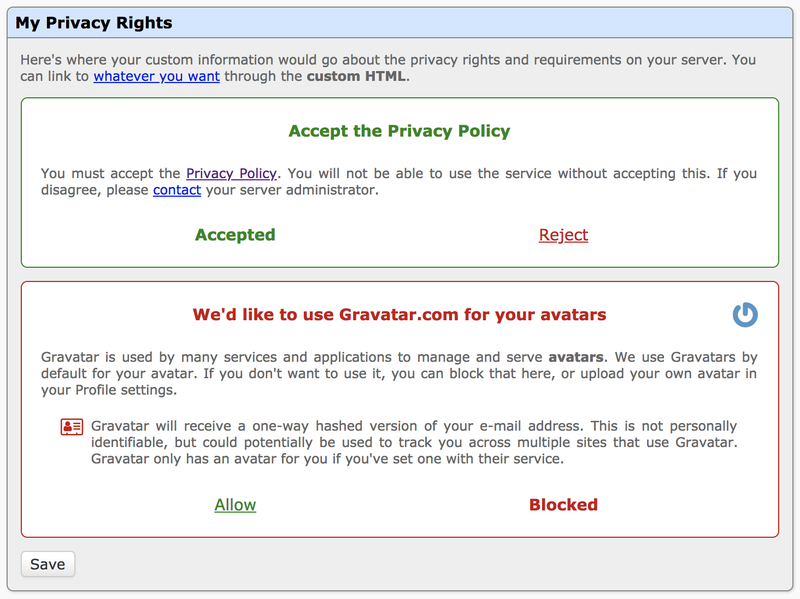 By default, Review Board only requests consent for Gravatars, but extensions can register their own features requiring consent. We'll be providing guides on incorporating this soon. When either of these are set, users will be prompted to view and approve the terms before they can use the server next, or when registering a new account. 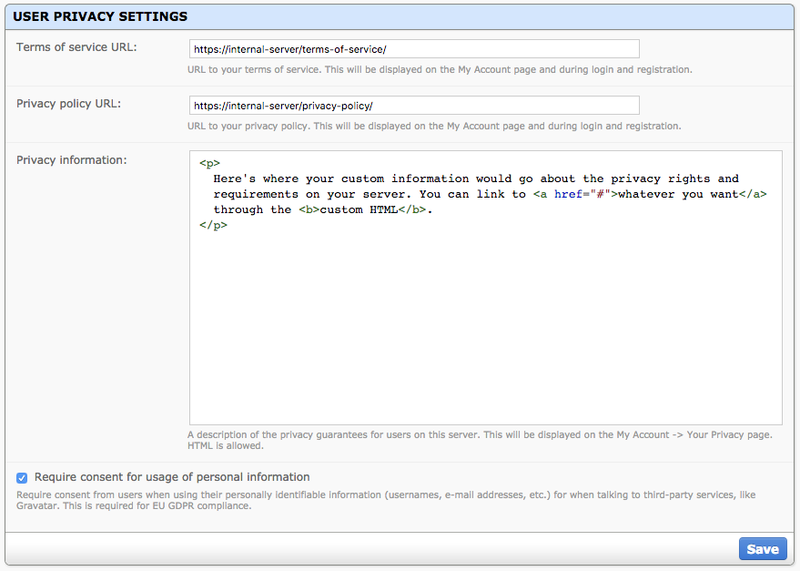 Privacy information is a text field for providing privacy details specific to your server or organization. This will be shown to users in the My Account page or when prompted for terms or consent. It accepts HTML, letting you provide links to important information in your network. Require consent for usage of personal information enables GDPR-compliant consent checks for features. Which enables the new consent management seen above. Today's release of Power Pack 2.0.1 is a small bug fix and maintenance release. The primary fix addresses various access issues with repositories hosted on Bitbucket Server and Visual Studio Team Services when transitioning license states (such as from a valid trial license to an expired one), which can cause future problems for users who need to use these repositories. We've also dropped support for Python 2.6, allowing us to focus on bringing Python 3.x support to both Power Pack and Review Board in future releases. Python 2.6 hasn't been maintained in years, and support was recently dropped in Review Board 3.0. The last release to support Python 2.6 is Power Pack 2.0. If you're still on Python 2.6, we can help you upgrade. Power Pack 2.0.1 is recommended for all Power Pack users, particularly those using Bitbucket Server and Visual Studio Team Services. Power Pack 2.0.1 supports Review Board 2.5 and up on Python 2.7. To upgrade, or to install for the first time, see the installation instructions. Learn more about Power Pack 2.0. Today's release of Review Board 3.0.6 fixes a handful of small issues throughout the product, from better source code management compatibility to more polished UI interactions. Using rbt post --submit-as and then publishing the review request once again sends out e-mails on behalf of the owner of the review request instead of the logged-in user. Links to comments in e-mails resolve correctly. Fixed problems fetching some files using GitLab API version 4, depending on how the diff was uploaded. Fixed timezone-related problems looking up or posting Bazaar changes and browsing Mercurial commits. The Description/Testing Done text fields once again grow to fit when adding lines and shrink when removing them. Revoking a Ship It now immediately crosses out the "Ship It" text on a review. I know what you're thinking. "Another Review Board release? Didn't we just have one this week?" We did, and it was pretty great, but not perfect. A regression with repository configuration slipped in and broke things, and we didn't want you to wait any longer for a fix. We've also been busy fixing other bugs this week, and felt it was as good a time as any to get those into your hands. So here they are. Some bad logic broke repository configuration, causing options to show up that shouldn't and others to not show up when they should. It was confusing, both for administrators and for Review Board when trying to sort out what was set. Bitbucket Server was showing up as a hosting service option twice if Power Pack was enabled. It was pretty excited to even be considered. Trying to enable Elasticsearch support without having the right module installed was causing a not-so-friendly error. Now it causes a very friendly error, telling you exactly to do to install compatible Elasticsearch support. It should also help clear up the confusion around versions. We require Elasticsearch 2.x (5.x or higher won't work) because the search framework we use is capped at that. That's... not ideal, and we're considering options here. Crafting a custom API token policy and hitting Save now properly switches the displayed policy type to "Custom" instead of "Full Access." While a reload would have fixed that, that was pretty misleading, and led to more problems than it solved (which was none — no problems were solved by that bug). As always, see the release notes for the full list of changes. Django released a new set of security releases that protect against swamping a server when passing certain strings to a few different functions used for building URLs and truncating content. See their announcement for the details on the fixes. We maintain security-hardened builds of Django 1.6.x, the version series we use for Review Board 2.0 through 3.0. 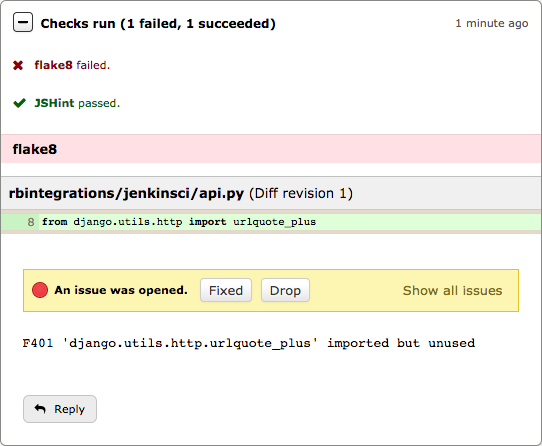 We've put out a new Django 1.6.11.7 release that contains these fixes. You can always keep up on the latest Review Board security announcements by subscribing to our Official Announcements mailing list, joining our Subreddit, or following us on Twitter. For years, companies have come to depend on Power Pack to track and report on the effectiveness of code review in their teams, to review code managed by GitHub Enterprise and Microsoft's Team Foundation Services, and to incorporate document review into their workflows. Today, we're ready to announce the next generation of Power Pack. On the surface, this brings a number of substantial quality-of-life improvements to Reports and PDF Document Review and new support for AWS CodeCommit and Bitbucket Server. Under the hood, we're in position to bring new collaboration features that we'll be announcing this year. Let's dig in to what Power Pack 2.0 has to offer. Generating reports for teams has never been easier. 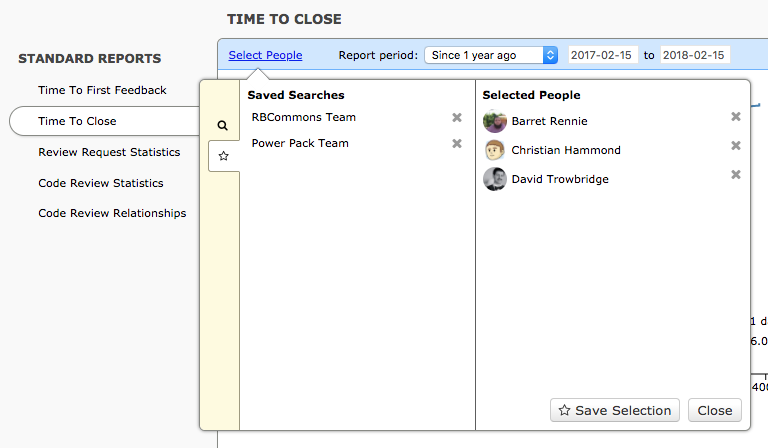 Our new UI lets you quickly locate the users and groups you want included in your report and to save those selections for future reports. Choose a reporting period (such as "This quarter to date," "Last week," or "Since 1 year ago") to instantly see a new report for the period. Bookmark the weekly report in your browser to always keep track of how your team's doing this week. Download a CSV file for any report to gain better insights using Excel or other tools. PDF document review has been completely redone to better fit in with the look and feel of Review Board 2.5 and 3.0, and to help you see more of your document at once. Pop open the sidebar to see thumbnails for each page in the document. The active page you're reviewing will be highlighted so you always know where you are and how much you have left to read. Navigation is smoother. Switching pages or zooming in or out of the document will keep your scroll position steady, so you don't lose your place. With Power Pack, you can now review changes in your Git repositories hosted on AWS CodeCommit and Bitbucket Server. Moving private repositories into CodeCommit or migrating from Bitbucket.org into an in-house Bitbucket Server no longer means changing code review tools. If you're new to Power Pack, why not give it a try? A 30 day free trial covers your whole server, and converts to a free 2-person license once expired. Ready to buy? A full license costs only $8.33 a user a month, for as many or as few users as you choose. Existing user? Follow the simple upgrade instructions to begin using Power Pack 2.0 today. Today's release of Review Board 3.0.3 focuses on a series of fixes and improvements for avatars, diffs for comments, extension packaging, and a few other things. The big highlights are with the new avatar upload UI and stability improvements. 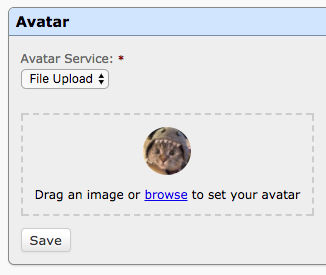 It's now easier to upload custom avatars. The UI has been completely redone, and gives you a better idea of how your avatar will look. Simply drag-and-drop any image to upload it. We've also fixed a handful of problems with custom avatar backends, to prevent them from occasionally disappearing or not being used. If you're building custom backends, we're interested in hearing if you're encountering any problems with this release. The Review Request API resource now includes the number of issues pending verification. Diffs shown alongside comments work once again under Python 2.7.6 and older. Subversion support is no longer broken when using modern versions of Subvertpy. Extensions providing LessCSS stylesheets will now package correctly when including stylesheets outside the extension. 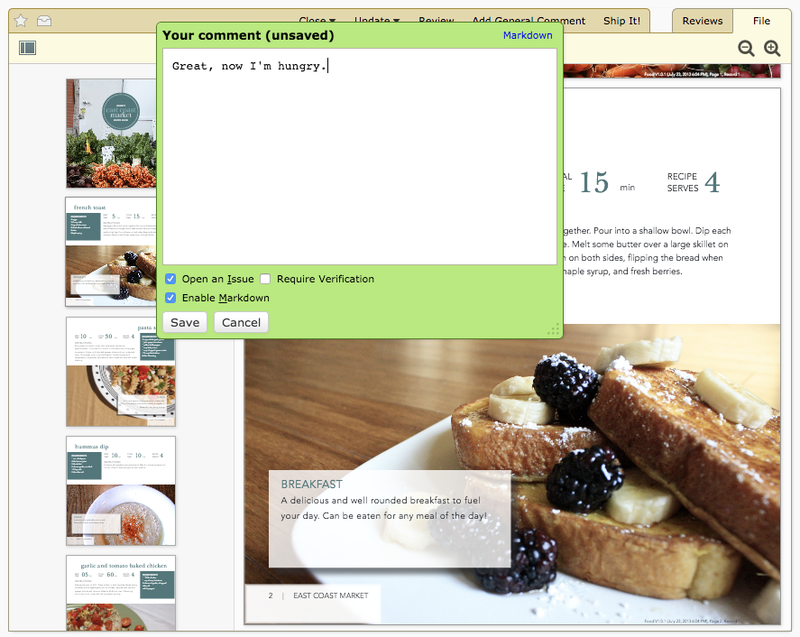 For over a decade, we've been building Review Board with the goal of making your code, UI, and documentation review process easier, helping you weigh in and spot problems before your customers do. But we know you're busy — we all are — and there's better uses for your time than checking every change for syntax errors, unused variables, bad imports, style consistency, and other problems that could have been caught ahead of time by code analysis tools. So we'd like to help you out. Review Bot is a self-installed service and extension for Review Board 3.0 that automatically reviews code changes posted for review. It integrates with a handful of popular command line code analysis tools, gathering results and posting reviews for issues found in the code. You can create as many Review Bot configurations as needed for your organization, running different tools for different repositories or review groups, and customizing the settings for each tool. More are coming soon, but you're not limited to what Review Bot ships with. You can also write your own integrations for tools used in your organization using Python. The message broker and Review Bot worker can be installed on the server running Review Board or on a dedicated server. Follow your preferred broker's instructions and the Review Bot installation guide to get everything set up. Please note that some tools may have their own installation requirements as well. If you have any questions or hit any problems as you get going, you can reach out to us on our community support forum. Priority support for Review Bot is also included as part of a Review Board support contract.